The Nord Stage 3 is the fifth generation of our successful Stage series continuing our vision of the ultimate instrument for the performing musician. Our outstanding new flagship instrument features our latest award-winning technologies including the Nord Lead A1 Synth Engine with sample playback, our acclaimed Nord C2D organ, a greatly enhanced Piano Section and extensive hands-on Effects - all in one exceptional performance keyboard. Two super-clear OLED displays for on-stage clarity, Seamless Transitions when changing programs/sounds, extended Split functionality with optional crossfade, and the addition of the new Song List Mode makes the Nord Stage 3 more intuitive and flexible than ever before for the live performer. The Nord Stage 3 has three sound generating sections; Piano, Organ and Synthesizer, all of which can be used simultaneously. Furthermore, the Nord Stage 3 has 2 separate slots allowing you to have 2 Pianos, 2 Organs and 2 Synths plus Effects at the same time for massive sonic flexibility. The Nord Stage 3 features automatically seamless transitions when changing sounds or programs while playing. A new Song Mode let's you easily organize a group of Programs for each specific song in the list. Each song can consist of up to 5 different Programs, freely assignable from your existing Programs. You can create unique Song Lists for different bands or situations and the names and order can be easily customized on the fly without connecting it to a computer. The super clear new OLED display offers excellent overview when selecting sounds and editing programs. The Nord Stage 3 also features 3 Split Points and a new Split Point Crossfade functionality. Choose among 3 different crossfade widths (Small, Large or Off) indicated by different LED colors. A new Split Point Editor Mode lets you easily organize and set up Split Points using the OLED display giving you a great overview of the assigned sound sources for each Split zone. The Nord Stage 3 also supports Program change via pedal allowing for flexible program changes (up/down) while keeping your hands on the keyboard. The greatly enhanced Piano section features doubled memory (2 GB) for the exclusive Nord Piano Library, 120 voice polyphony and creative new Piano Filters. The Nord Stage 3 features a wide selection of Grands, Uprights, Electric Pianos, Digital Pianos, Clavinet and Harpsichord from our exclusive Nord Piano Library - all handpicked for their unique characters! The Nord Stage 3 Piano section also features a brand new “Layer” category with rich dynamic layered patches. Nord’s state-of-the-art sampling techniques capture the extraordinary nuances and real character of the source instruments. Our unique ‘Advanced String Resonance’ and Dynamic Pedal Noise features deliver breathtaking realism and an unsurpassed level of expressiveness. The Nord Stage 3 Factory Bank features a very extensive selection of the Nord Piano Library but you can easily add or replace any of these sounds using the Nord Sound Manager. Our exclusive Nord Piano Library is constantly updated with new exclusive world class sounds, and always free of charge. A Long Release-mode adds a slightly longer release, more suitable for legato playing, emulating a looser damper tension in an acoustic or an electromechanical instrument. 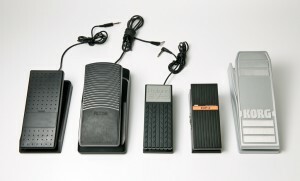 The Nord Triple Pedal (optional accessory) features our unique dynamic sustain pedal that enables the use of half-pedaling and "release and catch" techniques and also Sustenuto and Soft Pedals. The Nord Triple Pedal also recreates the mechanical sounds of lifting and releasing the damper mechanism, producing the characteristic thomp and sizzle sounds. The Pedal Noise feature responds dynamically to the force/momentum used when pressing or releasing the sustain pedal on the Nord Triple Pedal. The Nord Stage 3 features our latest award-winning C2D Organ simulations of B3 Tonewheel and Vintage Transistor Organs plus two brand new Principal Pipe Organs. Two different Organ models can be used simultaneously and the updated vintage 122 Rotary Speaker simulation is also available for each slot independently. The Nord Stage 3 Organ section features our award winning Nord C2D organ including the extremely authentic B3 Tone-Wheel simulation with four different tone wheel settings, ranging from factory new clean to leaky old vintage. The Organ section also features impeccable simulations of the classic 1960’s Transistor Organs, Vox Continental and Farfisa Compact with all the classic settings. The Organ section also contains two different new Pipe Organ models. Pipe 1 is a pure Organ with few harmonics. Pipe 2 is a recreation of metal pipes that commonly make up the backbone of a pipe or church organ, with a special detune mode when enabling Vibrato/Chorus. The Nord Stage 3 Compact now features Physical Drawbars offering ultimate hands-on experience for the dedicated organ players. This model also supports the Nord Half-moon Switch. The Nord Stage 3 88 and HP76 features Digital LED Drawbars, offering excellent overview over current settings. The Nord Stage 3 Synth section features the acclaimed Nord Lead A1 Synth Engine combined with Sample Playback and a brilliant OLED display for all Oscillator functions. The Lead A1 Synth Engine is renowned for its analog-modelling warmth, and utilises brilliant Smart Oscillator Configurations to deliver stunning results with little programming. There are both Single oscillator setups including Pitch and Shape modes, and Dual oscillator setups including Detune, Sync, Waveform, Bell and Noise Mix modes, FM and Ring Mod. The Synth section also provides 3 Unison modes, without reducing voice polyphony. The Nord Stage 3's new Oscillator section features 5 oscillator categories: Classic, Wave, Formant, Sample and brand new Super Wave (S-wave). The Oscillator Configuration concept allows for extremely quick and flexible programming, suitable for both advanced synth nerds and and less experienced sound creators. Start with a single Oscillator waveform, select an Oscillator Configuration, and use the secondary Oscillator Control to adjust the amount of desired parameter (pitch/shape/FM-modulation etc). Allows for adjusting the pitch of the main oscillator. Adds a second oscillator which can be pitched separately from the main oscillator. Allows for shaping Classic waveforms using a traditional waveshaping method. Waveforms from the Wave and Formant categories are shaped using a spectral shaping process. Emulates Hard sync by adding an additional oscillator that is the sync reference. Adds a second oscillator, providing a Sine, Triangle, Square or Saw wave. The pitch of the second oscillator can be adjusted separately. Adds a dedicated "Bell" oscillator, which uses a special FM algorithm to create a good foundation for bell type sounds. Adds a White Noise element which can be mixed with the main oscillator. Adds a filtered and slightly resonant Noise element to the main oscillator. The main oscillator is frequency modulated by a second sine wave oscillator with several pitch offsets for the second oscillator (-12 to +48 semitones). The main oscillator is modulated by a combination of two additional oscillators with several pitch offsets to choose from (-12 to +48 semitones). In this mode the main oscillator waveform is multiplied with a sine wave of selectable relative pitch, for classic Ring Modulation sounds. *=Not available when using Samples and Superwaves. The Nord Stage 3 Synth section has powerful sample playback capabilities and comes with an outstanding selection of samples from our Nord Sample Library. All samples can be tweaked creatively inside the Lead A1 Synth Engine and it is even possible to create and transfer your own samples using the Nord Sample Editor. The Synth section features 6 Filter types: Classic Transistor Ladder Filter (LP M), Low Pass 12 and 24, Band Pass, High Pass and a powerful new combined Low Pass and Band Pass (LP+BP) Filter. The Filter section also includes a dedicated Filter Drive with 3 amount settings, as well as selectable keyboard tracking amount (1/3, 2/3 and full). The Synth section features an Arpeggiator and LFO that can be easily synced to the Stage 3 Master Clock for perfect timing with other elements of the Stage 3, including its effects. The Nord Stage 3 Effect section features a brand new Filter Effect, extended morphable parameters, an enhanced Delay effect and a separate Reverb and Compressor for each slot. The powerful Effect section features a wide range of instantly tweakable high quality effects all modeled after classic stomp boxes, all available for each slot. Here you can choose from Tremolo, two Wahs, an Auto-Wah, and an AutoPan. Use the AutoWah with a Clavinet for raw funk licks, create a psychedelic vibe with an Electric Piano on AutoPan, or give a Wurlitzer some body using the Tremolo. There is also a Ring Modulator on board, an effect used by many experimental and electronic musicians. The two Phasers, two Choruses, the Flanger and a Vibe effect are modeled from the classic analog stomp boxes that define the sound of popular music. These swirling Phasers, metallic Flangers, and thick Choruses that are used by uncompromising professionals everywhere are crystal clear and faithfully simulated on the Nord Stage 3. Features authentic JC, Twin and Small speaker simulations with adjustable Drive, plus a separate Tube Drive simulation. This section also features a 3-band Equalizer with sweepable mid. A powerful addition is the new Filter (LP24/HP24), with Cut-off and Resonance controls that apply to the entire selected sound source (Organ, Piano or Synth). The enhanced Delay effect features morphable controls for Tempo, Feedback and Mix (Dry/Wet), as well as controls for Ping-Pong mode and Tap Tempo. New additions include 3 feedback filters (HP/LP/BP) and a dedicated control for enabling the Analog mode. The Compressor helps you keep the overall mix tight and under control, and now also features a new Fast mode and is separate for each Slot. The Nord Stage 3 features six different Reverb types (Hall 1+2, Stage 1+2, and Room 1+2) for adding some ambience to your sounds, and the amount is now morphable. The Reverb effect is now separate per Slot and also features a new Bright mode. The Master Clock function makes it easy to sync effects to other elements, like the arpeggiator, LFO or even one of the other effects. You can easily lock the effect rate to a range of note values – make the delay do quarter note triplets of what arpeggiator is playing, while the LFO gently sweeps the filter up and down in half notes, all perfectly interlocked. The Master Clock can also be controlled by an external MIDI clock – perfect for syncing your parts to a backing track, including tempo changes! The Nord Stage 3 wouldn’t be a master keyboard if it couldn’t control external devices with ease. The Extern section is designed solely for this purpose, so that any MIDI-connected gear gets seamlessly integrated with the Nord Stage 3’s built-in instruments. Zones, splits and layers are handled exactly as if the external equipment was a part of the Stage 3 itself. All settings are saved together with a Program so advanced setups can be immediately recalled in real-time during a performance. You can even use the Extern Section to automatically transmit Bank Select and Program Change messages to your external units. Each Fatar keybed is meticulously calibrated at the Nord factory to ensure an even response over the whole range. The Nord Stage 3 88 keybed uses our top-of-the-line fully weighted hammer action piano keys. Perfect for electric and acoustic piano sounds, but also works great for organ playing. Key range A-C. The Nord Stage 3 HP76 keybed uses amazingly portable weighted hammer action piano keys, limiting the weight of the Nord Stage 3 HP76 to only 12,4 kg (27,3 lbs). Key range E-G. The Nord Stage 3 Compact keybed uses semi weighted organ keys with a rounded "waterfall" tip, brilliant for rapid organ shredding and synthesizer licks, but also plays nice with piano sounds. Key range E-E. The Nord Stage 3 supports the following pedals: Fatar, Yamaha FC7, Roland EV-7, Roland EV-5, Korg EXP2 and Korg XVP10. 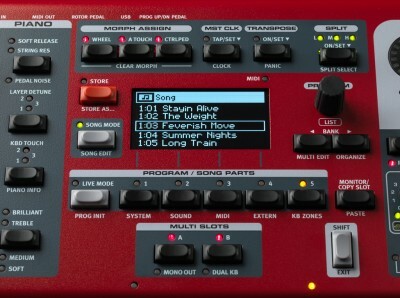 The Nord Stage 3 supports program change (Up/Down) via momentary two-button pedals such as the Boss FS-6 and Boss FS-7. Specifications subject to change without notice. *Steinway, Wurlitzer, Hohner, Clavinet, Farfisa and Vox are trademarks of their respective owners and are not affiliated or associated with Clavia. These trademarks are mentioned here as a reference to a sound only. Leslie is mentioned to describe a connector standard.